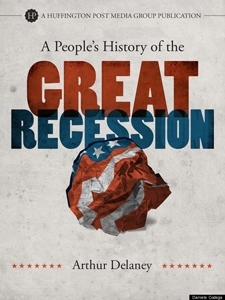 The Huffington Post announced today that they are getting into book publishing with the release of A People's History of the Great Recession, by Arthur Delaney. This is their first ebook, and it is now available in ebookstores everywhere. Every book about the economic crisis of the late 2000s focuses on the institutions that caused the recession and the brilliant geniuses who were at the top when it all went down. This book is about the people on the bottom who got flattened through no fault of their own. Their stories show what happens when the system doesn't work. Now our political leaders are in the middle of a big debate about how much the nation should spend on social programs that help people. This book asks the question a different way: How much indignity should regular folks have to suffer? You can get A People's History of the Great Recession at Amazon, iTunes, Barnes & Noble, and Kobo. Counting Funny or Die and Ars Technica, The Huffington Post is the third blog (that I know of) that have branched out from traditional web publishing into ebooks, and it makes perfect sense. Many readers come to a blog for the individual writers, not the name or brand. it would make sense that at least some of the readers will follow the writer over to the ebookstore. Also, you could look at the web content from a writer as a freebie for the ebook. Readers who like the writer already have a pretty good idea that they will like the ebook.